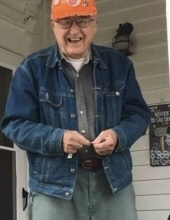 Gowanda, NY - Theodore Dubaj ,90, of Gowanda, NY passed away Friday March 22, 2019 at the Gowanda Nursing Home. He was born January 11,1929 in Gowanda,NY the son of the late Jacob and Dorothy (Kotwica) Dubaj and the late step father George Poloziak. On August 10,1957 he married the former Rose Marlewski who predeceased him August 26, 2000. Mr. Dubaj was a Korean War Veteran having served in the US Navy. He was employed for many years until his retirement with NY Bell, AT and T and Verizon Phone companies. He was a member of St. Joseph’s RC Church, Hidi Hose #4, Gowanda American Legion Post #409, lifetime member of the Slovenian Club, was an avid hunter and fisherman and was the proud owner of Camp Flathead. Mr. Dubaj is survived by 2 sons George (Deb) Dubaj of Gowanda, NY and David Dubaj of Canadaigua, NY and 2 daughters Judith (Joseph) Gassman of Winter Springs, FL and Sylvia (Eric) Joslin of Gowanda, NY and 7 grandchildren and 8 grandchildren and several nieces and nephews. Friends may call at Mentley Funeral Home Inc. 105 East Main Street on Tuesday March 26, 2019 from 4-8 pm. A Mass of Christian Burial will be said on Wednesday March 27, 2019 at 11 am from St. Joseph’s RC Church in Gowanda, NY. Burial with Military Honors will be in Holy Cross Cemetery in Gowanda, NY. Memorials May be made to the Gowanda Vol.Fire Dept. or the charity of the donors choice. To send flowers or a remembrance gift to the family of Theodore Dubaj, please visit our Tribute Store. "Email Address" would like to share the life celebration of Theodore Dubaj. Click on the "link" to go to share a favorite memory or leave a condolence message for the family.